27-Mar-2018 -- It was a family tour of the north-eastern state of Meghālaya during March 2018 during the school vacations of my kids, when my family and myself visited this Degree Confluence. On the last leg of our tour, we had a day spare and was to travel Guwāhāti (state capital of Assam) from Shillong (state capital of Meghālaya). My wife (Mrs. Sridebi Basu) suggested, that we can visit a Degree Confluence on that day if one is located within a travelling distance. On the previous day, I did some homework and found a Degree Confluence (26N 92E) off track from the Guwāhāti-Shillong National Highway No. 40 (NH-40). A quick checking on Google map app on my mobile estimated an extra travel of approx. 77 km from our hotel at Shillong. Then it was some walk of approx. 2 km through the agricultural fields, as it seemed from Google Earth. I was a bit pessimistic on whether our driver (of hired car, a sedan), Mr. Rakibuddin Ahmed would agree to the off-route travel. Also, I did not have a GPS instrument with me, but thanks to the mobile apps, I had an app which can use the GPS in my mobile and give the precise coordinates. I took an official confirmation from the Degree Confluence Project coordinator that a mobile GPS is acceptable. Next day, on 27 March 2018, before starting the journey at 8:30 am, I put up my proposal to explore the Degree Confluence. After I told Mr. Ahmed on what is a Degree Confluence and what we are up to, he agreed to take us there, till the point where the car can go without any major hindrance. Though he did not understand it fully but was convinced that it will be something new for him also. The weather for the day was pleasant but it was cloudy and it seemed that there would be some thundershowers. This was our last day at Meghālaya and we were happy to some extent as rain is an integral part of Meghālaya, and we did not get any rain in the last 6 days. As one may be aware that the wettest place on the Earth is in Meghālaya. We were only hoping that the rain should not continue for long as that may hamper our exploration. Mrs. Sridebi Basu (wife), Master Krishnendu Basu (son) and Miss Dwitia Basu (daughter) were my co-explorers this time. It was a thrill for my family to explore the Degree Confluence first time in their life. The drive through the NH-40 was smooth till we reached Nongpoh, 50 km from Shillong. We took the right-side road from the highway, through the Nongpoh market area. The market was bustling with morning crowd and vehicle from local villages around Nongpoh. Careful driving by Rakib took us to the road leading to our destination. From the highway (Nongpoh) the motorable location was about 25.5 km. Nongpoh onwards it was the mobile Google Map app that would guide us to the Degree Confluence. Our speed dropped to 20-30 km/h on this road, as the road condition was poor and mostly a single lane, through hills and valleys. The valleys surrounded by hills and hillocks were all cultivation lands. We passed small villages on our way. The road reached Marngar after about 5.0 km, where we took a left turn to continue. The road was also going up and down traversing through the picturesque green landscape. While all of us were enjoying the bumpy ride through the beautiful rural landscape, Rakib was feeling a bit uncomfortable to drive his car carefully through the uneven road. After 13.5 km of travel we reached Umden, the largest town on the route compared to the ones we passed till now. From Umden the rood took a left turn. The road to the location where we left metaled road was of the same nature and topography. The metaled road continued straight but we should go on a road branching off towards right. This road was just a gravel road and quite steep to when it took off from the metaled road. Our excitement was peaking as soon the car would come to a location where it couldn’t go further. The gravel road was wide enough for just two cars to pass by. Rakib gave full power to the car to climb up the steep slope with 5 passengers (3 adults and 2 kids including himself) and our luggage. The car went up the steep road with ease, though, but I sensed the tension in Rakib as we were not sure how this road would turn out to be and how far it would go. Google Map indicated that the road goes about 1.5 km and, it came out the same. After passing some abutting village huts and houses, we came to a village hut and stopped the car. These villages in Meghālaya are very remote and they rarely see a sedan car coming here, apart from some commercial vehicles for taking products from the harvest. A lady with her kids came out of the hut and looked at as like we are aliens in their land. Some dogs barked at us harmlessly as they also identified us as aliens in their area!! We reached the motorable location at around 11:50 pm. I told Rakib that it may be possible to go further but from here we go on foot. Rakib opted to stay in the car with our luggage as he was visibly tired from the drive on the uneven road. We four (my family) started on foot with the mobile in hand. I had already placed a marker at 26N 92E to lead us to the right spot. The place where we stopped our car was on a hillock and I knew that the point is in a valley. So, I was a bit afraid on whether we can go down all the way to the valley from there. We followed the gravel track keeping our fingers crossed that it would lead us to the Confluence. The track started to descend steeply and I was happy that I could reach the valley shortly. We could see the valley at a distance. The road was steep with loose gravels so we were stepping steady not to slip on loose gravels. The track stopped reaching at the edge of the agricultural fields. From this location we saw the location of the Degree Confluence, it seemed to be just at the foothill (hopeful to be lucky). 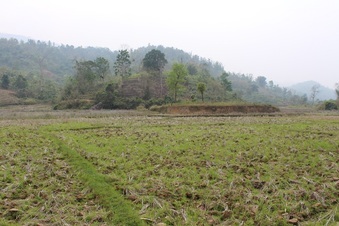 The piece of the agricultural field is abutted by hills and a narrow stream is passing on one side of the land. We went on the hilltop by man-made steps on the hillock sloped face down to the agricultural field. Out of the many earthen wall bound fields in the valley, only two ladies were working at a nearby field where we stepped down. They gave us a similar alien look. Some children were also near the stream, ran away laughing and conversing in the local language, the stream had a log kept across. A careful balance was required to cross the stream. All of us enjoyed this successfully crossing of the stream. I guided my family with the mobile Google Map in my hand through the field. The harvest happened possibly a month back, so the fields were covered with wild weed. Again, lucky here that the field was not being farmed, then it would have been wet and muddy. Our walk was still slow as we had to balance over the narrow earthen divides. We reached the point which I placemarked and put on the app which shows the Lat and Long of the place along with the accuracy. We all wanted to see the exact 26°00'0.00"N 92°00'0.00"E on the GPS. Moved around a bit and located that point just on the foothill. The time was 12:15 pm. There was a narrow flow of water along the foothill and my wife wanted to cross that and climb up the slope with the GPS to see all zeros in the coordinate. The seconds place was fluctuating within +/-0.1" of the exact point. My wife removed her shoes to cross the water and climbed up the slope about 1.5 m above the adjoining ground. Still the point kept fluctuating. When we were getting Lat as 26°00'00.0" then the longitude was off by +/-0.1" and the vice-versa. This kept happening for some time and we all were expecting to catch the exact location on the GPS. While we started taking pics of the screen, the sun was just on top of us so the pictures of the mobile screen were reflecting the sun. Here came my son with the brilliant idea of screen capture!! Yes... we can do that! I took screen shots and pictures of the mobile on the ground. Standing at this location viewing North was the hill slope with growths of trees and bushes. South was agricultural field and a hillock starting from the boundary of it. Both East and West side view were also part of the valley with agricultural fields. Finally, after many tries and moving within a few meters around that spot, we were unable to get all zeros. We spent a good half an hour at the location. My wife, son, and daughter were all excited to reach this Degree Confluence, the only one in Meghālaya for the first time. After taking the mandatory pictures and pictures of ourselves, we started our return journey. The crossing of the fields and the stream was easier this time as we had negotiated this while going to the confluence. The steep uphill climb on the gravel track to our car was tiring as the sun was scorching and it was quite humid. I remembered that we needed the name of the village where we stopped our car, so I asked the lady in the hut in Hindi and then in English. She was saying something in her local language which was nothing similar to any language known to us. She had no idea of what we were asking, so she referred to some gentlemen working at a distance in her yard. They hopefully understood something and what came out (I think), the name of the village is "Juye". We put up the best effort to understand the pronunciation and took it as the name of this remote village near the Degree Confluence. The doubt that will remain in our mind forever, till maybe someone else revisits the place and gets the name of the village. With the sweet memories we started our return journey from the place towards Guwāhāti.